For divers, undulate rays make wonderful underwater photography subjects. 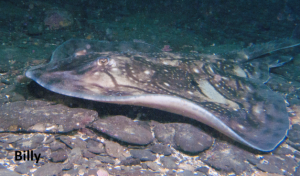 For identification, a photograph of an undulate ray is taken from above. Having the full width of the ray in the photograph really helps the recognition software. 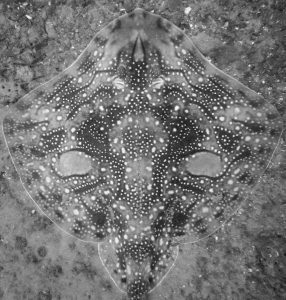 If you would like to take the perfect shot for recognition, read about how to take a picture of an undulate ray and how we process them here – not that we won’t try to match it if it moves and you cut the nose off in the photo. We would also like to know where you saw the undulate ray. We know anglers and diving skippers like to keep their marks secret, but a general area like East of St. Alban’s Head or on The Shambles, that’s good enough for us. If you are catching many undulate rays in one position we would very much like to talk to you about diving that site. 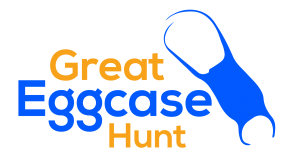 Eggcases are more difficult, there are 13 different mermaids’ purses on the Great Eggcase Hunt leaflet. The Shark Trust are the experts, please send your photos of all eggcases to them at: -. If you are a diver, please look out for eggcases, you often see catshark eggcases tied onto corals or other sea creatures, but we don’t know what happens to ray eggs, do they stick to rocks or weed, do they become buried in the silt or do they wash around in the tide becoming stuck in rocky crevices? Wherever you see eggcases underwater please report your sightings to the link above. The Boring Bit:- Copyright to all photographs submitted to The Undulate Ray Project remains with the photographer (or to whomever they assign such copyright). 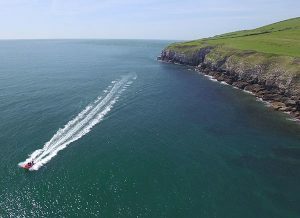 If The Undulate Ray Project wish to use photographs for handouts, websites, presentations or other promotional material, permission will be sought from the photographer (or to whomever the copyright is assigned) beforehand. If after such use The Undulate Ray Project is approached regarding commercial use of photographs both parties will be put in contact with each other for discussions to take place.